The finale match between Team DARwIn from Virginia Tech/University of Pennsylvania and Japan's CiT Brians, from BotSport. First published at www.vt.edu, 28 June 2012. BLACKSBURG, Va., June 28, 2012 – Virginia Tech’s Robotics and Mechanisms Laboratory dominated RoboCup’s international humanoid robot soccer competition for the second year in a row, once again wining the Adult- and Kid-sized humanoid soccer robot competitions. The robotics laboratory, part of the Virginia Tech College of Engineering, took first place finishes in the Adult Size class with the 5-foot humanoid robot CHARLI-2 and the Kid Size class with the miniature-humanoid-robots DARwIn-OP. The latter team was a joint effort of Virginia Tech undergraduate and graduate engineering students and their counterparts from the University of Pennsylvania’s College of Engineering in Philadelphia. Team DARwIn, in the final match of the Kid-Sized competitions, beat Japan’s CiT Brians, 8-2, on June 23. Earlier in the day, Team CHARLI, comprised only of Virginia Tech students, won 3-0 over Tsinghua Hephaestus of China. A combined Virginia Tech/University of Pennsylvania team also entered, for the first time, the Mid-Sized humanoid robot division, commonly referred to as Teen-Sized, but did not make final rounds. The robots were built from remainder parts of robots at the respective Blacksburg and Philadelphia campuses, said Hong. An earlier incarnation of CHARLI-2 won the Louis Vuitton Cup at RoboCup 2011 in Istanbul, Turkey, bringing it to Blacksburg, Va., and the United States, for the first time. This year, a German team was selected as the winner of the cup. During its stay at Virginia Tech, the cup was housed at Randolph Hall in a display case with the first version of CHARLI in the main lobby. RoboCup is considered one of the most respected competitions in the robotics research community, and proposes a soccer match between full-size humanoid robots against the human World Cup human champions -- and win -- by the year 2050. In addition to the soccer portions, RoboCup also features competitions in robot rescue efforts, robotic simulation, and a robot dance competition for youth. CHARLI-2 (that’s for Cognitive Humanoid Autonomous Robot with Learning Intelligence) is the second in a series of adult-sized, autonomous humanoid robots built at Virginia Tech. The first version, known as CHARLI-L (the "L" is for lightweight) debuted in spring 2010, and made national headlines, appearing on the cover of Popular Science and Robot magazines. More recently, CHARLI-2 appeared on the cover of The Washington Post’s Sunday magazine, in November 2011. It is the second year in a row that the laboratory has used and won with the DARwIn-OP humanoid robots, developed together with Purdue University, University of Pennsylvania, and the robotics company, Robotis Co., with sponsorship from the National Science Foundation. About 400 units are currently being used world-wide for robotics research and education, according to Hong. DARwIn-OP proved quite popular at this year’s RoboCup. A total of eight teams used the OP ’bots, which are a fully open source design -- both software and hardware. All info on the hardware is to be shared online for free, including detailed plans and drawings, manuals for fabrication and assembly. The Japanese team that played Team DARwIn in the final round built their own robots. Hong started project DARwIn (that’s Dynamic Anthropomorphic Robot with Intelligent) in 2003 to study human locomotion and humanoid robot design. DARwIn 1 was introduced in 2004 and was a revolutionary humanoid robot prototype at the time, and was followed by several incarnations since. Following CHARLI’s repeat win in the Adult-Size division of RoboCup 2012’s robot soccer competition, the United States’ Team DARwIn also scored a repeat win in the Kid-Size robot leagues. The team won in a final match against Japan’s CiT Brians, 8-2 on Saturday in Mexico City. Team DARwIn is a joint venture between Virginia Tech’s Robotics and Mechanisms Laboratory and the University of Pennsylvania’s GRASP laboratory. 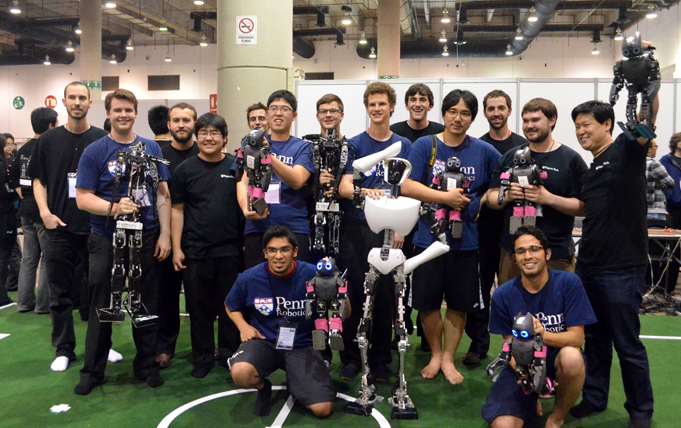 It is the second year in a row that RoMeLa has used and won with theDARwIn-OP soccer-playing humanoid robots developed together with Purdue Univ., Univ. Penn, and ROBOTIS Co. sponsored by NSF. About 400 units are currently being used world-wide for robotics research and education. 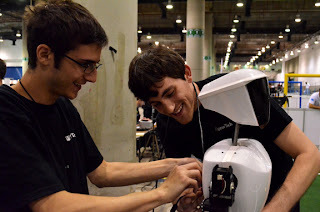 A total of eight teams at this year’s RoboCup competition used the OP ’bots, which are now open-sourced and also available for purchase. It is a fully open source design -- both software and hardware. All info on the hardware is to be shared on-line for free, including detailed plans and drawings, manuals for fabrication and assembly. Under director and founder Dennis Hong, RoMeLA started project DARwIn (that’s Dynamic Anthropomorphic Robot with Intelligent) in 2003 to study human locomotion and humanoid robot design. DARwIn 1 was introduced in 2004 and was a revolutionary humanoid robot prototype at the time, and was followed by several incarnations since. semi-final match on 24 June 2012. One of the best aspects of RoboCup is the friendly atmosphere among competitors. There's no strife or ill will, fights, or sabotage. Teams help each other out, ask to borrow screwdrivers, duct tape, and camera tripods, and are never turned down if the objects are at hand. Moments ago, Team DARwIn -- comprised of Virginia Tech and University of Pennsylvania students -- won against Team 2JUDancer, 9-0 in a semi-final match. After the game, hands were shook, and the two teams posed for this photo. Now that is sportsmanship. Virginia Tech’s Robotics and Mechanisms Laboratory continued to dominate in the Adult- and Kid-Sized robotics leagues during its third day of competition, Friday, 22 June 2012, at RoboCup 2012’s soccer leagues. As the morning of the fourth day, and the final day, began, the competition hall – once echoing with the noise of dozens of teams prepping for games, was quiet as only a handful of remaining teams prepped for a last battle. Among them Virginia Tech and our partners, the University of Pennsylvania. Teen-Size: Team DARwIn-XOS (consisting of University of Pennsylvania and Virginia Tech students) lost its only game of the day, 0-1, but remained in the semi-finals, scheduled for 10 a.m. today. We’ll have updates as the day progresses… Check out ww.robocup2012.com for more details. CHARLI immediately following a match at RoboCup. -Jack Newton, a rising senior in computer engineering, from Blacksburg, Va.
-Coleman Knabe, second-year master’s student in mechanical engineering, from Newport News, Va.